Olde Marco was first settled in the 1880’s. Tucked into this historic area is the Café de Marco, celebrating 29 years in this unique location. Travel down Bald Eagle to Palm St and turn left. A contemporary décor waits in a historic building. 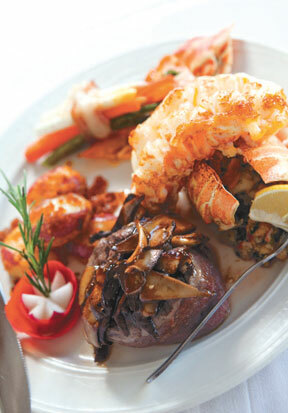 Everyone’s favorite, Surf & Turf. $27 is served with wine. There are eight different entrees on the anniversary menu. 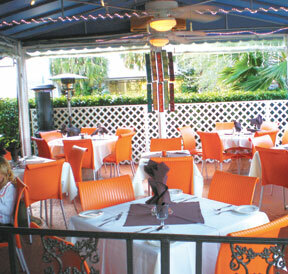 The Café de Marco is known for its diverse selection of fresh seafood and continental specialties. Local residents and hotel staff recommend the restaurant to visitors because of the top quality award winning seafood and specialties, service and ambiance. 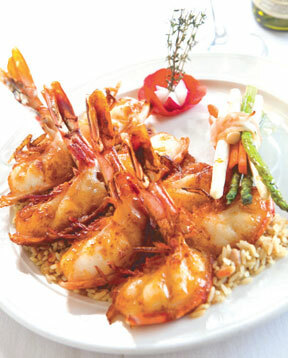 Jumbo Prawns, one of their specialties. menu. Diners who require gluten free or entrée substitutions should call ahead with the guidelines for the best experience. There are new culinary creations coming to the menu. New also, is the South Beach look with a redesigned courtyard, front deck and chickee bar. Private parties are welcome to reserve one or all of the three rooms with parties of 12 to 70. Reservations for all diners are requested at this very popular restaurant.